The store at Hesperia Lake Park is open every day of the year except Christmas Day to serve the needs of anglers, campers and picnickers. Anyone wishing to fish or camp must first register at the Lake Store. The store is well stocked with an ample supply of bait and tackle, as well as a variety of camping supplies, drinks and snacks. Store hours vary throughout the winter and spring, call the Lake store at (760) 244-5951 for current hours. Daily - 6:00 a.m. to 7:00 p.m.
Sunday through Thursday - 6:00 a.m. to 5:00 p.m.
Friday and Saturday - 6:00 a.m. to 7:00 p.m. Through April 30, camping is $25/night. Includes up to 4 people. $2.00 for each additional person, (limit - 6 people per campsite). $2.00 per dog, (limit - 2 dogs per campsite). Limit - 5 days of camping per 30 day period. Camping/reservation dates must be between April 3 and April 30. Call (760) 244-5951 to make your reservation by phone. Looking for an escape? Hesperia Lake is open for camping throughout the year. Open spaces and cool clear air make a perfect setting for spending quality time with the family. 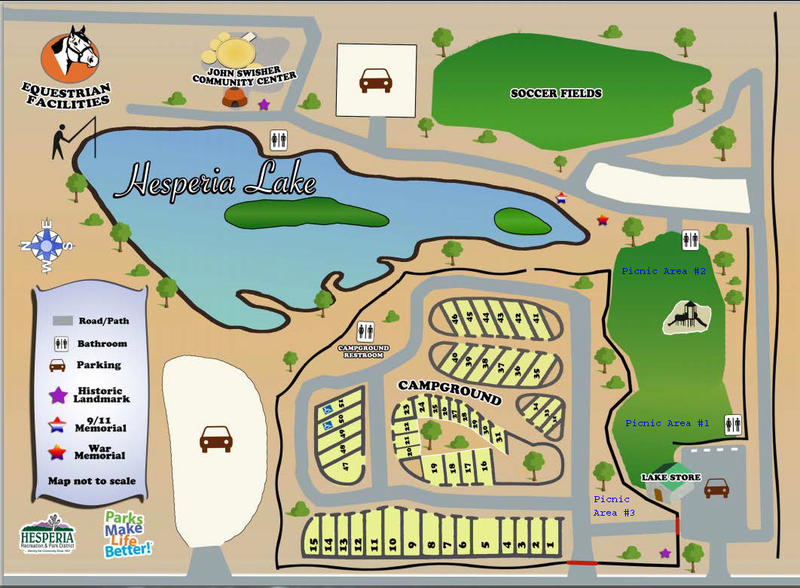 A variety of sites are available at Hesperia Lake to accommodate RV’s and tent campers. All sites have a picnic table and fire ring. RV sites will accommodate a vehicle up to 40 feet in length. Electricity and water are available in selected sites and restrooms and showers are available at no extra charge. Potable water is located throughout the campground. Check-in is at 2:00 p.m. Checkout is at 12:00 p.m. Fishing is an additional fee. Camping $35.00 per night, up to 4 people, $2.00 for each additional person (Limit 6 people per campsite). $2.00 per dog, (Limit 2 dogs per campsite). Camping Sunday through Thursday $20.00 per night with military I.D.. Camping Friday and Saturday $25.00 per night with military I.D..
No state fishing license is required. Hesperia Lake is a pay-to-fish lake. Adults pay $18.00 per session and have a five (5) fish limit. Seniors who are residents of Hesperia, can fish Wednesday and Thursday, excluding holidays, for only $15.00 and still catch five (5) fish. Children 10 years and younger are $6.00 with paid adult and have a two (2) fish limit. Night fishing has ended for the 2018 season. Hesperia Lake has special days for seniors 55 and over. Every Wednesday and Thursday, excluding holidays, seniors who live within Hesperia Recreation and Park District boundaries can take advantage of a senior discount. Resident seniors can fish for only $15.00 on these days and still catch five (5) fish. Hesperia Lake Park is a great place to host your next outdoor party, meeting, or celebration! Hesperia Lake Park is open all year. Individual picnic tables are available throughout the park. Patrons may bring their own propane barbecues. Group sites are available for a reasonable fee and reservations need to be made in advance. Groups of 25 or more people must have reservations. All reservations must be made in person at the Lime Street District Office, 16292 Lime Street, Monday through Friday, 8:30 a.m. to 4:00 p.m.
For availability, call (760) 244-5488. There are three individual picnic areas available to reserve. *All rentals require a deposit of $50.00. Deposits are not applied to fees. Deposits will be refunded providing all rental terms and conditions are met. Checks will be mailed out 2-4 weeks following your event. Day Use – FREE – includes one rig (truck and trailer) and one corral. Overnight Camping Sites – $20.00 per night. Check-in time is 12:00 p.m. and check-out time is 11:00 a.m. the following day. Camping fee includes one rig (truck and trailer) and the use of two corrals. Click Here to view the rental information and application.